This is a weekly series focused on analyzing the previous week's economic data releases. The objective is to concentrate on leading indicators of economic activity to determine whether the economy is strengthening or weakening, and the rate of inflation is increasing or decreasing. This week we examine factory orders, NFIB small business optimism, the JOLTS report, the budget deficit, Consumer Price Index, and Producer Price Index. 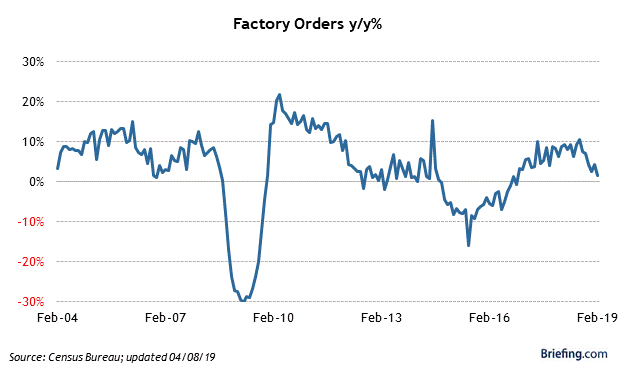 Factory orders are feeling the brunt of the slowdown in global trade. These orders, which show the dollar amount of new orders for durable and non-durable goods, fell 0.5% in February. January's increase of 0.1% was revised down to unchanged. Orders for durable goods declined an unrevised 1.6%. The strength we saw in January in non-defense capital goods orders ex-aircraft, otherwise known as business investment, didn't last long. Orders here, which increased 0.9% in January, declined 0.1% in February. The shipment of these orders also declined 0.1% after increasing 1.0% in January. Orders for nondurable goods rose 0.6% in February, but largely due to the rise in oil prices. This report reflects a continued deceleration in the rate of economic growth. 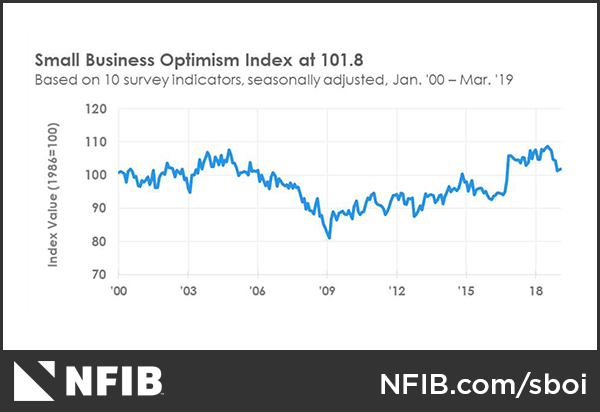 Optimism remains relatively strong, which is important because it impacts spending and hiring decisions by business owners. This index rose 0.1 point to 101.8 in March. The only negative within the components of this report was related to bloated inventories, which is reflected in other economic data as well. The only other problem was that business owners can't find the qualified workers they need to fill open positions, which has led to reports of increasing compensation holding at historically high levels. 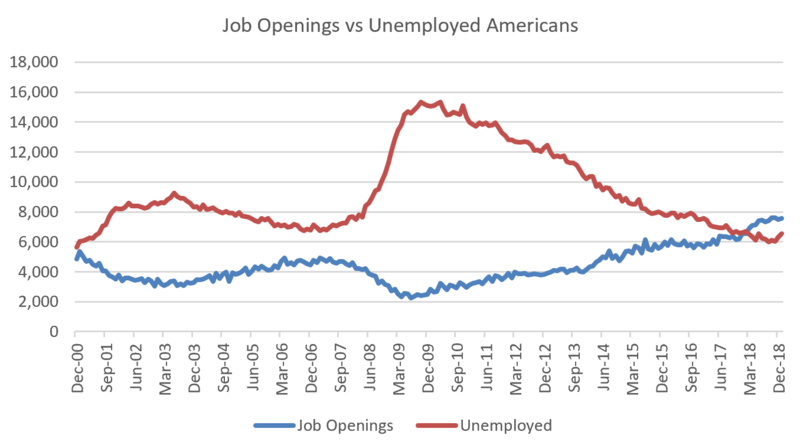 The Job Openings and Labor Turnover Survey is reported with a greater lag than other employment data, but it is still interesting to look at the relationship of job openings to the number of unemployed workers. It was surprising to see a huge drop in job openings in February, as this number was down over 7% to 7.087 million. The number of hires was down 2.3%, which is in line with the February employment report of a measly 33,000 jobs created. This led to the difference between openings and unemployed workers shrinking by 400,000 to what is still a significant 1.4 million. 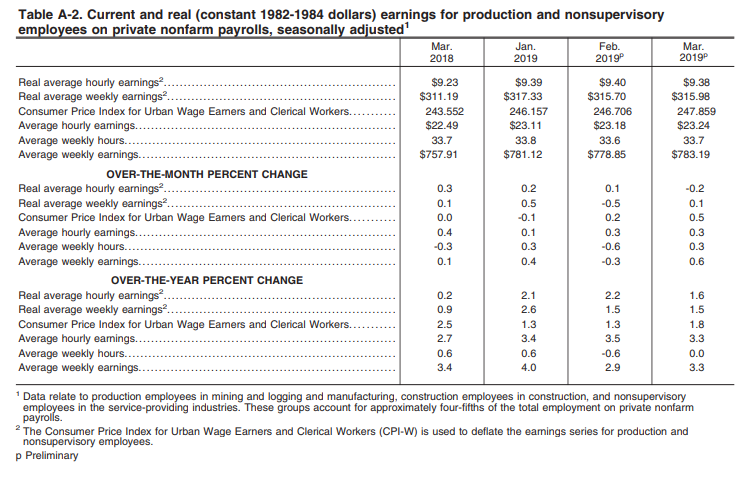 This still is a positive report for the economy, but it does suggest a labor market that is weakening modestly. 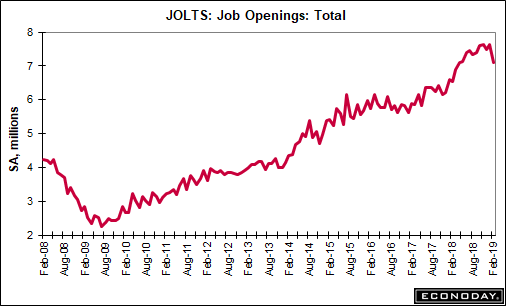 It will be interesting to see if next month's report confirms the strength we saw in the March jobs numbers. Deficits don't matter, right? We better hope not, because ours keeps getting worse and worse and worse with no end in sight. I guess it doesn't matter until it does, but then it's too late. 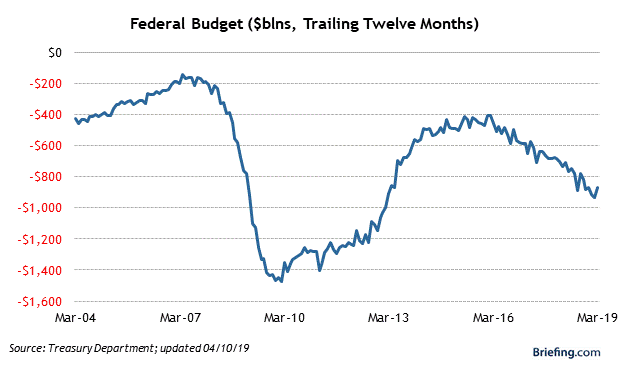 The budget deficit was $146.9 billion for March, and that was better than expected! Still, the total deficit for the first six months of the fiscal year is $691 billion, which is 15% greater than this time last year. Our deficit is worsening because revenues are declining. While individual income tax receipts are down 1.7% to $723 billion for the first six months, corporate tax receipts plunged 13.5% to just $68 billion. Where's the growth? Meanwhile, the largest increase in outlays came from interest expense on our debt, rising 15% to $190 billion. This is not sustainable. We are stealing future growth with increased borrowing and irresponsible tax reductions. This will slow the rate of growth moving forward. Consumer prices surprised to the upside, rising 0.4% in March. The increase was fueled by higher energy costs and housing. Rents rose 0.4% and are now up 3.7% on an annualized basis. 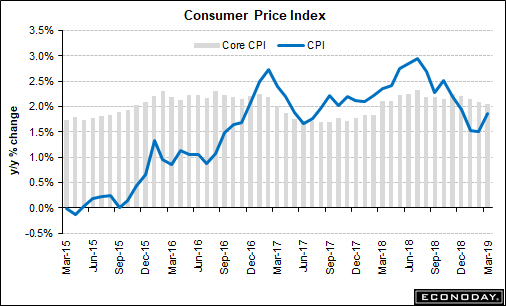 The overall Consumer Price Index rose 1.9% year-over-year, which is up from last month's 1.5%, while the core rate (excludes food and energy) is up 2.0%. I'm more concerned about how the rate of inflation relates to wage increases, and on that front, we saw no change last month. 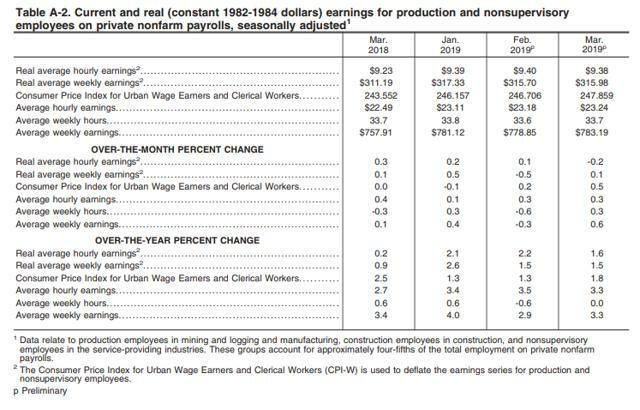 While real average hourly earnings fell 0.2% in March, an increase in the length of the workweek led to no change in the rate of growth for real average weekly earnings for production and non-supervisory employees at 1.5%. This is still improving and bodes well for continued consumer spending growth. The Producer Price Index increased 0.6% in March, which was double the consensus expectation of 0.3%. Producer prices have risen 2.2% compared to a year ago. Energy price increases of 5.6% were the main catalyst, but when we exclude food and energy, the core rate is up 2.4% compared to last year. 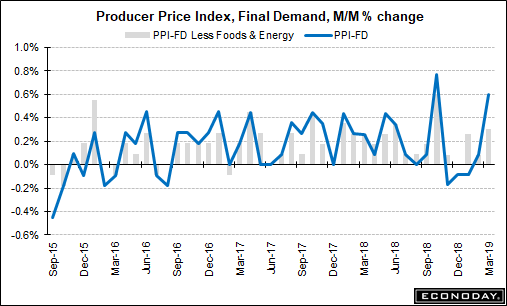 Producer price increases lead consumer price increases, so I expect we will see higher rates of inflation down the road. This is not the consensus call! It also means it is very unlikely that the Fed cuts interest rates later this year. I continue to see a decline in the rate of economic growth coupled with a gradual increase in the rate of inflation. This is going to make the Fed's job extremely difficult, as it is myopically focused on stock market performance. It has already indicated it will allow the rate of inflation to float above its 2% target on the basis that the rate has been below this target for several years. It will target an average rate of 2% moving forward. This is easier said than done. Higher rates of inflation will lead to higher long-term interest rates, which would be the death knell for financial markets. We need interest rates to remain low in order for this economic expansion and bull market to continue. The Portfolio Architect is a Marketplace service designed to optimize portfolio returns through a disciplined portfolio construction and management process that focuses on risk management. If you would like to see how I have put my investment strategy to work in model portfolios for stocks, bonds and commodities, then please consider a 2-week free trial of The Portfolio Architect. Additional disclosure: Lawrence Fuller is the Managing Director of Fuller Asset Management, a Registered Investment Adviser. This post is for informational purposes only. There are risks involved with investing including loss of principal. Lawrence Fuller makes no explicit or implicit guarantee with respect to performance or the outcome of any investment or projections made by him or Fuller Asset Management. There is no guarantee that the goals of the strategies discussed by will be met. Information or opinions expressed may change without notice, and should not be considered recommendations to buy or sell any particular security.